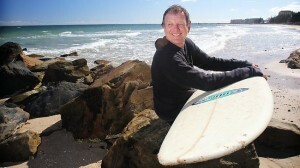 Chronic back pain sufferer Pete Mills has been unable to enjoy the euphoria of surfing across the waves for 10 years. Now, he is counting down the days until he can once again “hang ten”. His recovery is owed to world-first soft-tissue injury diagnostic technology developed by Adelaide doctor, Mark Rogers. Dr Rogers has a patent pending on a diagnostic infra-red camera that uses digital thermal imaging to detect the precise place, which he then targets with a .4mm “cold laser” to stimulate tissue healing and repair. The treatment, which uses a laser’s light but not heat, should see Mills, 64, riding his surfboard again in late May. Mills has suffered back pain for 35 years and has not been able to work for the past 10 years. Physiotherapists and chiropractors hadn’t been able to relieve his pain so he began cold laser treatment at Dr Rogers’ Parkside clinic, Your Healthy GP, in November. “I was really quite sceptical at first because it was a modern medical treatment,” Mills said. “Before this I would go out to dinner and because of the pain, within 10 minutes of sitting down I wouldn’t be able to enjoy myself. He still has a couple of weeks of treatment left, but already feels he is standing taller. “When you feel consistent pain, you find a position where the pain is the least uncomfortable and that can change your posture,” he says. Apart from treating lower back pain Dr Rogers uses the therapy to treat tinnitus, migraines and neck pain. Dr Rogers, a migraine sufferer, began treating patients after it worked to erase his own pain. He has been using cold laser therapy for 13 years, but only recently combined the treatment with the diagnostic camera – similar to the “hot spot” camera used in cricket – to better target the source of the pain. “In my book there is no such thing as a bad back – it’s a soft tissue injury,” Dr Rogers said. He hopes the technology will soon become widely available in Australia.